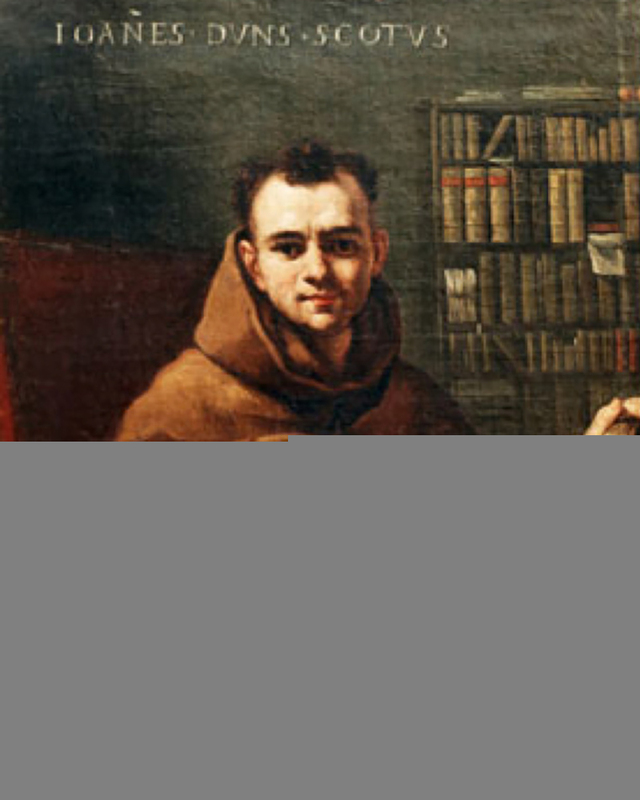 J ohn Duns, commonly called Duns Scotus is generally considered to be one of the three most important philosopher-theologians of the High Middle Ages. Scotus has had considerable influence on both Catholic and secular thought. The doctrines for which he is best known are the "univocity of being," that existence is the most abstract concept we have, applicable to everything that exists; the formal distinction, a way of distinguishing between different aspects of the same thing; and the idea of haecceity, the property supposed to be in each individual thing that makes it an individual. Scotus also developed a complex argument for the existence of God, and argued for the Immaculate Conception of Mary. Hayagriva dasa: Scotus, a Thirteenth Century Scotsman, was Thomas Aquinas's principal antagonist. Whereas Aquinas emphasized the intellect, Scotus emphasized what he called the primacy of will. The will is even superior to the intellect, and this is true for both God and man. Scotus felt that if this were not the case, the will would not be free but would be controlled by the intellect, which is exterior to the soul. Srila Prabhupada: According to the Vedic understanding, intelligence, or intellect, is superior to the mind, and superior to the intelligence is the ego. The mind is superior to the gross senses and controls them. If the mind acts intelligently, the senses can be utilized for self-realization. If the mind does not act intelligently, the senses act for material sense gratification. This is the conclusion of Bhagavad-gita. A dog also has a mind, but his intelligence is inferior to that of human beings. When a dog sees some eatables, he will come for them, although his master may drive him away. If he has a little intelligence, he goes away when his master tells him to, but due to his limited intelligence, after a few minutes he may return. He has a mind capable of remembering that there is something eatable for him, but he hasn't sufficient intelligence to know that the food is forbidden. That is the difference between the mind and the intelligence. Therefore, according to the Vedic understanding, intelligence is superior to the mind. Hayagriva dasa: Where does the will enter? Srila Prabhupada: Thinking, feeling, and willing are activities of the mind, and are within the mind. Hayagriva dasa: Scotus believes that everything is subordinate to the divine will. Srila Prabhupada: Of course, because the divine will is always perfect. Whatever is divine is perfect and flawless. Whatever the Supreme Divine Personality wills actually becomes a fact. Our thinking, feeling, and willing differ from the supreme will of the Personality of Godhead. Our mind proposes, and God disposes. We may express our will, but unless our desires are sanctioned by the will of the Supreme, they cannot be fulfilled. Despite our willing to live to a certain age, for instance, we cannot do so if God does not will us to. In every sphere of activity, we express our will, but our will must be sanctioned by the supreme will in order to be successful. Therefore God's will is called supreme. Hayagriva dasa: Scotus would say that everything is good because it is sustained by God's absolute will. God's killing is good, for instance, simply because God wills it to be so. Srila Prabhupada: Yes. Because God is perfect, whatever He does is perfect. Hayagriva dasa: Scotus's view is in opposition to that of Aquinas, who would say that everything is subordinate to the divine intelligence. Srila Prabhupada: But what does he understand by the divine intelligence? In relation to us, divine intelligence is this: We living entities are eternal servants of God, but we have wanted to become God ourselves, master of everything. Ignorance, or maya, thus differs from divine intelligence. In the ignorance of materialism, people work very hard to become monarchs of all they survey. All this is taking place under various "ism's." We are thinking that we are proprietors, but the Supreme Lord is the only factual proprietor. Hayagriva dasa: Scotus believes that there is an interplay of the will and the intellect because before we will something to be, we must first know the facts about it. Despite this counterplay, Scotus maintains that the will alone is the total cause of volition in the will. Srila Prabhupada: Yes, that is thinking, feeling, and willing. When we are ignorant, we think our will is supreme. So-called philosophers like to say, "I think," or "I believe," but this is not perfect knowledge. Perfect knowledge is thinking as God Himself thinks. Hayagriva dasa: Scotus affirmed that it was the Church's unfailing authority that provided the criterion of truth. Church dogma was sacred, and philosophy was naturally subordinate to it. Revelation was behind all Church dogma, and therefore sacred dogma is not open for debate. Srila Prabhupada: If by "church" we mean an institution wherein we can learn about God, then philosophy is certainly subordinate. In such a Church, we can learn what God Himself is, what He is willing, and how He is acting. We may learn this either from the Bible or another scripture. However, if the Church is polluted by imperfect interpretation, and there are different factions, the truth is lost. At such a time, the authority of Christ is no longer imparted. People become free to think and act as they like, and thus God's kingdom is lost. Hayagriva dasa: Because the parampara is broken? Srila Prabhupada: Yes. The Church is the supreme authority provided that it maintains itself in exactly the same way and does not deviate from its beginning. As soon as we interpret and divide, the message is lost. Hayagriva dasa: The Protestants claimed that the parampara of the Catholic Church was broken, therefore they broke from Catholicism and fragmented into many different sects. Srila Prabhupada: Yes, they condemned the Catholic Church because its parampara was broken, but they concluded, "Let us also break." Those who first broke away from the message as it is and those who followed them by breaking away themselves are both to blame. Since the original solidarity of the Christian religion is broken, the Christian religion is dwindling and losing its importance. Hayagriva dasa: For Scotus, apart from being a human being, each individual is also a specific personality. The individual is the ultimate reality because prior to existence he existed in essence in the mind of God. Srila Prabhupada: The real fact is that the living entity is eternal, and the material world is created to satisfy his false existence, which is called false ego ( ahankara). The individual is thinking that he is independent and can act independent of God. That is the beginning of paradise lost, of Adam's fall. When Adam and Eve thought that they could do something independently, they were condemned. Every living entity is the eternal servant of God, and he must act according to the desire or will of the Supreme Lord. When he deviates from this principle, he is lost. Losing paradise, he comes into the material world, and God gives him certain facilities to act, but says, "If you act according to this system, you can come back to Me. If you do not follow this system, you go down and down." That is the process of transmigration, the rotation of the cycle of birth and death. This is all due to disobeying God. When the living entity hears the instructions of the Supreme Lord, he again revives his original constitutional position and returns home, back to Godhead. Hayagriva dasa: Aquinas believed that the angels—what the Vedas might call devas —have pure spiritual forms, but Scotus argues that only God Himself has a purely spiritual form since only God is perfect essence. Srila Prabhupada: Yes, since God exists in His spiritual form, He never falls down; therefore He is sometimes called Acyuta. When a person falls from his original, spiritual position, he is cyuta, fallen. God, however, is Acyuta because He is not subject to falling down. Hayagriva dasa: Scotus rejects the method of negation, the neti-neti process, as being of no particular value. Knowledge of God must be positive, and negative concepts only presuppose a positive concept. Srila Prabhupada: Yes, the neti-neti process is for those who are still speculating. This is an indirect process by which one negates everything material. Positive understanding means taking direct knowledge from God Himself. "Now hear, O son of Prtha, how by practicing yoga in full consciousness of Me, with mind attached to Me, you can know Me in full, free from doubt." (Bg. 7.1) The word asamsayam means "without a doubt," and samagram means "complete." Following Krsna and trying to understand Him is called bhakti-yoga, and such yoga is possible for one who is actually attached to Krsna. Therefore our first business is learning how to be attached to Krsna (mayy asakta-manah partha). There are nine different aspects of bhakti-yoga:sravanam kirtanam visnoh smaranam, etc. Of these, sravanam (hearing), and kirtanam (chanting), are most important. Then there is remembering, worshipping in the temple according to the regulations, rising early in the morning, offering aratrika , and so forth. This is the process of bhakti-yoga meant to increase our devotion for Krsna. When attachment increases, we become very obedient and always engage devotedly in His service. When Krsna sees that we are obeying Him, He reveals Himself. "To those who are constantly devoted and worship Me with love, I give the understanding by which they can come to Me." (Bg. 10.10) These are the words of Sri Krsna speaking directly to Arjuna, and we take this to be a perfect statement. What is the purport I give to this in Bhagavad-gita As It Is? Hayagriva dasa [reading]: "In this verse the word buddhi-yogam is very significant. We may remember that in the Second Chapter, the Lord, instructing Arjuna, said that He had spoken to him of many things, and that He would instruct him in the way of buddhi-yoga. Now buddhi-yoga is explained. Buddhi-yoga itself is action in Krsna consciousness; that is the highest intelligence. Buddhi means intelligence, and yogam means mystic activities, or mystic elevation. When one tries to go back home, back to Godhead, and takes fully to Krsna consciousness in devotional service, his action is called buddhi-yogam. In other words, buddhi-yogam is the process by which one gets out of the entanglement of this material world. The ultimate goal of progress is Krsna. People do not know this; therefore the association of devotees and a bona fide spiritual master is important. One should know that the goal is Krsna, and when the goal is assigned, then the path is slowly but progressively traversed and the ultimate goal reached. "When a person knows the goal of life but is addicted to the fruits of activities, he is acting in karma-yoga. When he knows that the goal is Krsna, but he takes pleasure in mental speculations to understand Krsna, he is acting in jnana-yoga. And when he knows the goal and seeks Krsna completely in Krsna consciousness and devotional service, he is acting in bhakti-yoga, or buddhi-yoga, which is the complete yoga. This complete yoga is the highest perfectional stage of life. "A person may have a bona fide spiritual master and may be attached to a spiritual organization, but still, if he is not intelligent enough to make progress, then Krsna from within gives him instructions so that he may ultimately come to Him without difficulty. The qualification is that a person always engage himself in Krsna consciousness and with love and devotion render all kinds of services. He should perform some sort of work for Krsna, and that work should be with love. If a devotee is intelligent enough, he will make progress on the path of self-realization. If one is sincere and devoted to the activities of devotional service, the Lord gives him a chance to make progress and ultimately attain to Him." Srila Prabhupada: So this is the process in summary. Hayagriva dasa: Scotus argued for the existence of God on the basis of primary cause, but he felt that the proposition "God exists" is not of much use unless we understand what God is and know something of His nature. "It should be understood that all species of life, O son of Kunti, are made possible by birth in this material nature, and that I am the seed-giving father." (Bg. 14.4) Everything is coming from the womb ( yoni) of material nature. If the earth or material nature is the mother, there must be a father. Of course, atheists think that a mother can give birth without a father, but that thinking is most unnatural. One next asks, "Who is my father? What is his position? How does he talk? How does he live?" First we must understand that there is a creator father, and then we can understand His nature. This understanding must be beyond a doubt ( asamsayam). Hayagriva dasa: Scotus was also opposed to Aquinas in his belief that the human soul can be separated from the body, and when it is separated, it is not changed at all. When the soul is united with the body, it activates the body, but the soul itself is beyond corruption. The individual soul is incapable of destroying itself or giving itself being. Srila Prabhupada: The individual soul is always separate from the body. That is the Vedic injunction: asango hyayam purusah iti ( Brhad-aranyakopanisat 4.3.16). If the body actually mixed with the soul, how could the soul give up one body and accept another? The soul is always aloof from the body, from its material formation. The living entity, the jiva-soul, is always asanga, incorruptible.